Mallard Creek Golf Club is home to beautiful 36-hole public golf course set on 350 acres of gently rolling and lush Northeastern Ohio terrain. Just a short drive from the Cleveland area, residing on the north side of route 82 in Columbia Station, Mallard Creek serves tens of thousands of golfers each year and is home to corporate and fundraising outings, leagues and public tee-times. Our meticulously maintained course features an expansive layout with some of the best views on the Westside of Cleveland. With lush fairways and true-rolling greens, Mallard Creek is the best choice for you and your friends to tee it up for 9 or 18 holes… or more! Beyond that, our golf course features full cart paths, 180 golf carts, practice greens, driving range, pavilions, snack bar, and there is also a full-service restaurant next door, Bootleggers! 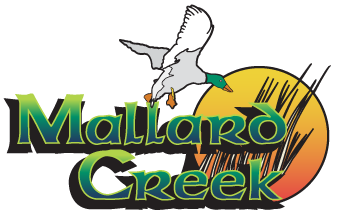 From the low handicapper to the weekend warrior, Mallard Creek offers a challenging, yet forgiving layout designed to keep pace of play and provide an enjoyable round for all. Call 440-748-8231 or click the ‘Tee Times’ button above to book your tee time. We look forward to seeing you this season! Mallard Creek Golf Club is proud to be a Fairways Partner Course and one of the four courses included within theFairways Golf Membership. For just $398, you can now play Unlimited Golf at any Fairways Partner Course – any day, any time for ALL of 2018 & 2019. Seriously! We hope to see you soon. If you have any questions, would like more information regarding our facility or want to schedule an event, please give us a ring at (440) 748-8231 or send us a message by clicking here. Sign up for updates from The Duck and you will always be the first to know about specials, course happenings, membership news and more here at Mallard Creek Golf Club!